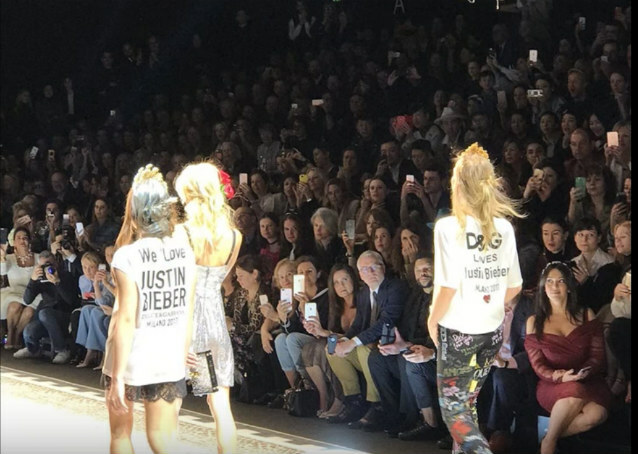 Justin Bieber was all over the D&G Milan runway, despite not actually attending. Justin Bieber made his way on to the Dolce & Gabbana runway via a series of T-shirts that featured his face splashed across the front. Some with glittering hearts or the word “king” written beneath JB’s image, the homage was a loving tribute to one of the few celebrities who wasn’t in the audience. But it begs the question: Why Justin Bieber?? and why now? According to Vogue, Justin’s status as a fashion influencer has seen him do everything from star in Calvin Klein ads to inspire a sold out Vetements hoodie, and he continues to make headlines for his style. The designers are long term Beliebers and have dressed him for several big events—including the Cannes Film Festival. JB was also making store appearances for the house as far back as Fashion’s Night Out in 2011. The brand’s ongoing history with the Biebs may have something to do with the runway moment—and could hint at a collaboration down the line—but the shirts could also reflect another Dolce & Gabbana tradition. The designers have devoted pieces to icons such as Madonna and David Bowie in previous seasons, so this could be them honoring another one of their favorite musicians.